By TLex Here’s the new Deep 500M Automatic Chronograph from Chris Benz. This is only CB's second Swiss mechanical diver and it is something they are very proud of, too. Last month we previewed their first serious model, the upcoming Deep 2000M Super BUBBLE. There isn't anything particularly revolutionary about the design of the new Chrono - it's pretty generic looking, but it’s great to see CB finally making some watches that are (for want of a better word) a little more substantial. Interesting choice of hands, too! The 45mm case is constructed from solid marine grade Stainless steel. It comes with a screw down engraved case back (with serial number), a helium escape valve and a scratch-resistant Sapphire crystal. It is water-resistant to 500m/50bar. Further features include: a unidirectional rotational divers bezel with elapsed dive-time and screw down lockable crown and Chrono pushers. 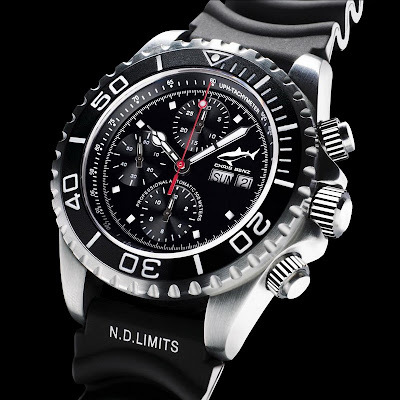 The watch is powered by a Swiss-made ETA automatic movement and is presented on an injection molded black rubber divers strap with N.D. LIMITS table.